What would you do if you suddenly woke up and realised you were dreaming and could fly around in your dream just like Superman or Neo in The Matrix? Well, many people do just that every night in dreams they are consciously awake in. The totally amazing ability to do this is called lucid dreaming. And now YOU can do it too! Lucid dreaming is something that has been around for quite a while, but only now is available in a form that cuts out all the previous rigmarole, nonsense, and near-mysticism that has traditionally surrounded the subject. WILD - Waking Induced Lucid Dreaming - simply involves training the mind to accept the possibility of projecting itself into a lucid dreaming state at will. Something virtually anyone can achieve using this simple technique; a method that requires very little practice in order to produce incredibly startling results! You’ll love learning to lucid dream The WILD Way. It’s very easy to do and it will change your life forever! 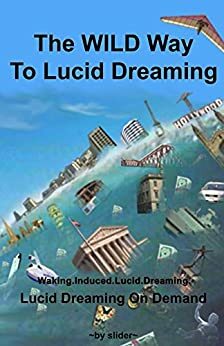 As a long-time experienced lucid dreamer who usually employs Dream-Initiated Lucid Dreaming (DILD) rather than WILD (Wake-Initiated Lucid Dreaming), I found there were both good and bad aspects to this book. The author - who by all accounts does seem to be very talented at WILD - professes the belief that virtually anyone can quite easily learn to do it, but in my experience most people find WILD to be rather difficult. In the book, a single basic method for inducing lucid dreaming from a waking state is described. That method is presented clearly and succinctly, along with a couple of good relaxation techniques, and from what I know of WILD, it does seem to be a good method. However, the book only describes the author's personal method of WILD induction, and doesn't cover any other WILD induction methods (I know of some others). One problem with the book is the speculative claims that go along with the basic WILD method presented. It irritated me how he repeatedly attacks DILD in ways which seem unnecessary and even factually incorrect. At times the author seemed willing to admit that DILD and WILD are merely two different routes to the same state of mind, while at other times he strongly implies that the state of lucidity obtained with WILD is somehow qualitatively superior, without ever stating exactly how. In my own considerable experience, I have found that DILDs can be just as coherent and as conducive to rational experimentation within dreaming as WILDs. I also disliked how he ignores most of the current scientific research into dreaming, and how he often did not provide references for factual claims made. So even as he offered a decent method for WILD, he also spread a bit of misinformation about dreaming in general, swept most scientific results about dreaming under the rug, and speculated a bit grandiosely on some hypothesized eventual "importance" for lucid dreaming, without ever explicitly stating exactly what he believes that "importance" might turn out to be. Another good aspect of the book is that no particularly far-out claims are made, such as that from inside a dream state one can "see the future" or do "out of body remote viewing" (as is asserted in many books on lucid dreaming), although such possibilities are not totally rejected. In that respect, the book portrays a level-headed perspective. Another weakness of the book is that inadequate tribute is paid to how one's personal expectations heavily shape lucid dreaming experiences, and sometimes without sufficient evidence the author seems to assume his personal experiences reflect general truths. For example, he implies that initiating dreaming while lying on one's right side vs. the left side results in entirely different "types" of dreaming (an assertion that is empirically unverified and could merely reflect his own personal expectations / theories). One major thing I have learned in my own lucid dreaming practices is that one's personal expectations are of *primary importance* when inhabiting a virtual reality your own mind creates. The author does make clear that the major advantage of WILD - provided one is able to master it - is the ability to do lucid dreaming virtually at will, and to remain aware throughout the entire process, and that is truly an advantage. But in my opinion he seriously exaggerates both the ease of mastering WILD, and the overall importance of the achievement if one does succeed, for in the end, as exciting and interesting as it can be, even lucid dreaming is still only... dreaming. 5.0 out of 5 starsWorth the investment! The worst that can be said of this book is that it leaves you wanting more. On the plus side it is an excellent guide which will aid a great deal in reaching your goals. It is well worth the investment. I'm giving this book one star because the author sets you up to fail by giving you a technique that is unlikely to work, tells you how easy it is and then criticizes a much easier and more widely practiced method of lucid dreaming which is dream induced lucid dreaming.This technique might have better odds of working if the author instructed you to attempt WILDs at a time of night when you are in REM sleep which is after 4-6 hours of sleep. He instead implies you can do this right at bed and it will work. This is highly unlikely as we don't go into REM sleep right away when sleeping at night. I think he found a technique that works for him (maybe) and so makes the false assumption that it is the best method and will be easy for everyone else. I do not recommend this book. I really like the book as it taught a very doable technique for lucid dreaming using the hypnagogic state. I feel that I am on my way to doing a WILD (Wake Induced Lucid Dream) which with this technique, may be actually easier than most others. With some practice, and following directions, lucid dreaming may be possible in weeks instead of months.